Watch our video about our story and our mission. ​a community of funders, social entrepreneurs and conscious consumers supporting impact businesses. Angels of Impact believes that we can end poverty and give the impoverished control of their lives. We do this by supporting social enterprises working on poverty alleviation, to grow into sustainable businesses. Our angels are focused on the long-term success of the impact businesses that A.I. supports and helps to market their products and services. So they flow resources to the entrepreneurs who are too big for micro-finance but too small for more traditional impact investors. Supporting impact businesses is what the Monitor Group calls ‘enterprise philanthropy’, and it is resources that can be recycled to do more and more good. Angels of Impact believes passionately that together we can achieve these 3 key United Nations Sustainable Development Goals: #1 No Poverty; #5 Gender Equality and #12 Responsible Consumption and Production. By investing in and consuming responsibly produced goods made by women living in poverty, you achieve all 3 goals at once. Furthermore, Angels of Impact will re-invest majority of its profits to help grow the ecosystem and strengthen more social enterprises. A.I. 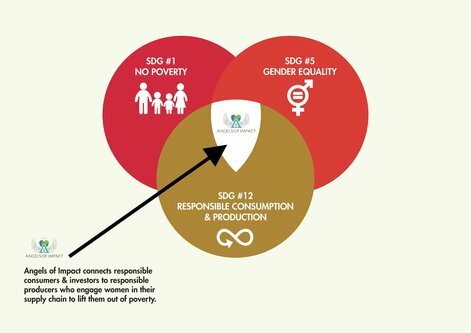 's goals shown as three overlapping circles: No Poverty, Gender Equality, Responsible Consumption and Production. Want to know more? Learn the facts about why poverty is a man-made problem that can be solved, how women are powerful agents of change and why social enterprises need funding from people like you. Give us your email address and you'll be taken to a downloadable PDF which explains all this and more. Learn More About Sustainable Impact!